One approach to completing the tutorial in the JumpStart Rails book by Andy Hawthorne has you creating a sandboxed development environment. If you use Windows, the following will be a particularly useful solution for you, especially if you want to try out another option for installing Rails, other than the Rails Installer as described in the book. 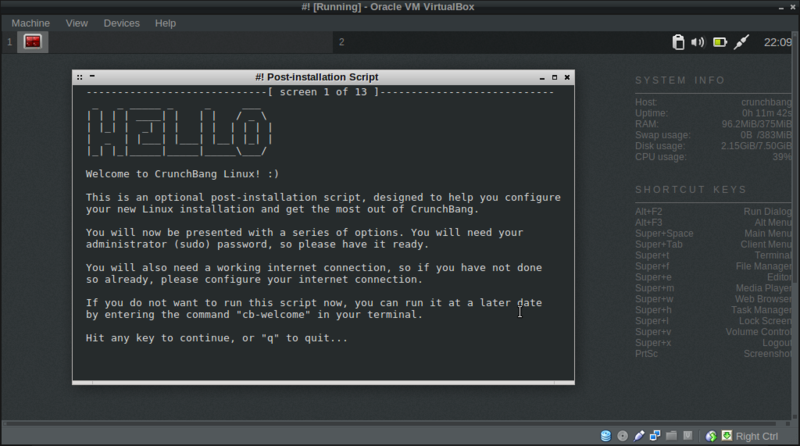 I’ve used Linux for quite a while now, but recently installed the CrunchBang distribution (#! to its friends). This is based on the ultra-stable Debian distribution and describes itself as a ‘nimble’ operating system. It certainly is – I’ve found it to be fast, stable and there’s also a vibrant and friendly community. I’m going to go through the installation from start to finish so that we have Ruby, Rails and Postgresql all installed and ready to roll. 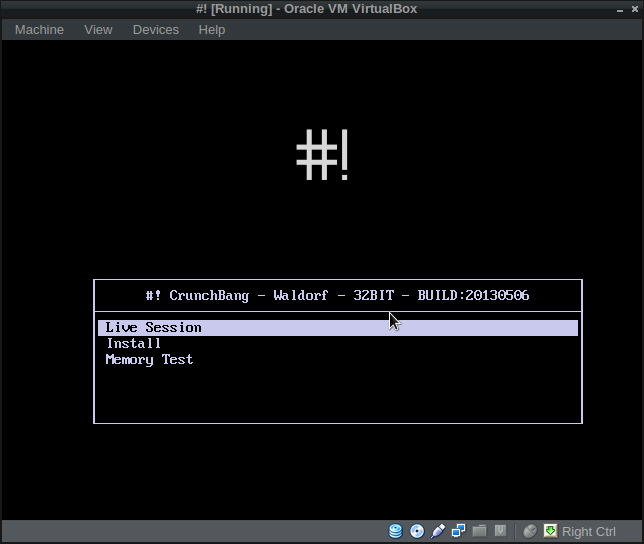 Personally, I’d recommend that you install CrunchBang as your new primary operating system, but if you don’t want to go that far then we’ll look at using VirtualBox to install it on a virtual machine. If you want to run #! 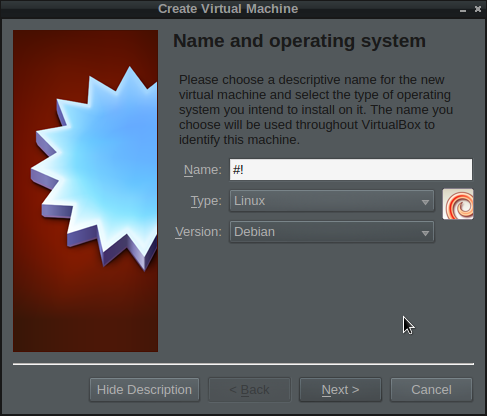 on a virtual machine, you’ll need VirtualBox or some other virtualization software. You can get it from here. The installation instructions are included for all major operating systems. You’ll also need the ISO image for #! which you can get as a torrent from the CrunchBang website. Once you’ve got those two items, it’s time to install #!. Use the arrow keys to move down to ‘Install’ and press ‘Enter’ to start the installation process. The first few screens ask you to select your language, loacation and keyboard layout. Select the appropriate options using the arrow keys and then press ‘Enter’. Next, after a few files have been loaded, you’ll be asked to enter the hostname, I just went with the default ‘crunchbang’. Then you need to enter you personal details as well as a password. Once this is done, you’ll be asked about partitioning the disk – choose the first option ‘Guided – use entire disk’. Click on ‘continue’ and then select the virtual HD we set up earlier. On the next screen, since this is just on a virtual drive, it’s easiest to choose the first option ‘All files in one partition’. If you are installing this on your actual machine then I’d suggest choosing the either the second or third options to keep home directory separate. Once you’ve selected this, you’ll be shown a summary of options. Click on continue, then select ‘yes’ to confirm and the installation process will begin. This takes 20-30 minutes so you’ve got enough time to go and get a coffee at this point. Towards the end of the installation you’ll be asked if you want to use the GRUB installer. Choose yes and click ‘continue’ and then wait for the installation to finish. 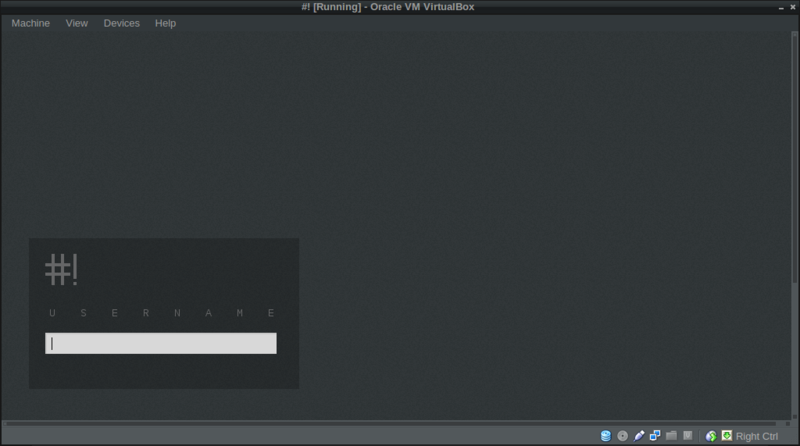 The virtual machine will then reboot and #! should load up. You might get a fatal error that says the machine will abort. If this happens, select ‘Ignore’ to see the error message. If this is ‘The guest is trying to switch to the PAE mode which is currently disabled by default in Virtualbox’, then all you need to do is click ‘ok’ then go to settings in VirtualBox, select ‘system’ from the menu on the left, then click on the ‘Processor’ tab and check the box marked ‘Extended Features PAE/NX’. After this reboot the virutal machine and it should load up without any problems. When you first login there is an installation script that runs, asking you if you want to install things such as Java and printer support. We don’t need any of these for what we’re doing here, but feel free to install anything that you think will be useful. If you want to skip this step and come back to it later then just close the window. You can always run it at a later time by entering the command cb-welcome in a terminal window. Finding Your Way Around #! Now that you’ve successfully installed #!, you might want to spend some time having a look around and getting to know how it works. It uses the Openbox window manager which can take a bit of getting used to, but is also highly customizable. Everything can be controlled from the main menu which is accessed by right-clicking anywhere on the desktop. There are also a number of shortcut keys for performing tasks. These are shown on the right of the desktop (for example super+w opens Iceweasel, the default browser, which is basically an unbranded version of Firefox). That thing on the right is Conky which basically shows information about your system. You can put quite a lot of information there – see this thread for more information. 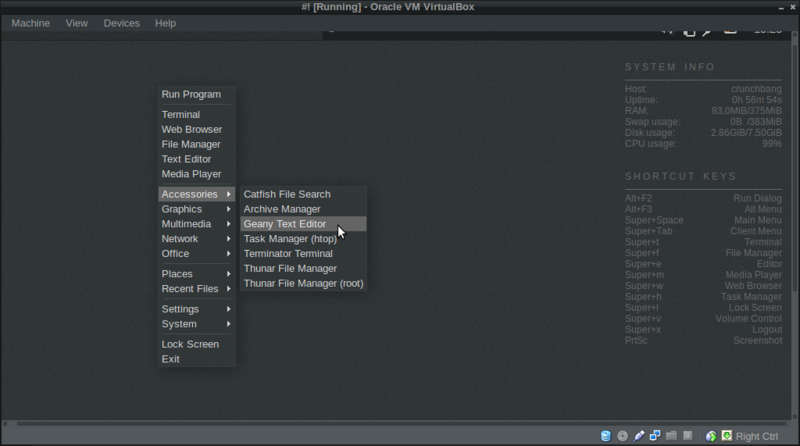 !# uses multiple desktops and uses 2 as default that can be seen as tabs at the top of the screen. These are useful for organizing your different windows that are open (work and play for example). The default text editor is Geany which is very powerful. You can open it using super+e or right-click on the desktop and go down to ‘Accessories’ and select ‘Geany Text Editor’. If you want to install any software, you can use the Synaptic Pakcage Manager. Just right-click anywhere on the desktop and go down to ‘System’ and then select ‘Synaptic Package Manager’ from the menu. Now Dropbox should automatically start every time we log in! This will then start the installation process for Ruby and Rails. It can take quit a long time, so this might be a good chance to grab another cup of tea. If everything has gone to plan, you should see similar versions to those listed above. All we need now is a database server! sudo is used for any commands that require administrator privileges, so you’ll be asked to enter your password to complete the installation. Just one last thing to install now! And now you’re all set and ready to jump start into the world of Rails. I hope that you enjoy using #! Linux and might consider using it for more projects in the future. I’d love to hear what you think of it in the comments below.